PHILADELPHIA — Abstraction is, by its very nature, an exercise in reduction, in simplifying the elements of form, material, and subject matter to their very base, or one might say, to the very limits of where one can possibly go. This search for the edges of visual representation often takes artists on different journeys, many of which overlap in unexpected ways. 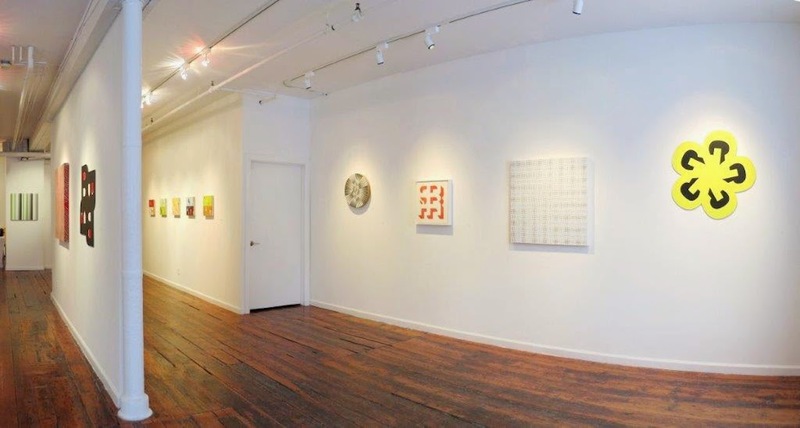 Territory of Abstraction, a recent exhibition at Pentimenti Gallery in Philadelphia’s Old City, is an exploration of these interconnections and of the multifaceted ways in which abstraction can manifest itself in a peculiarly contemporary manner. 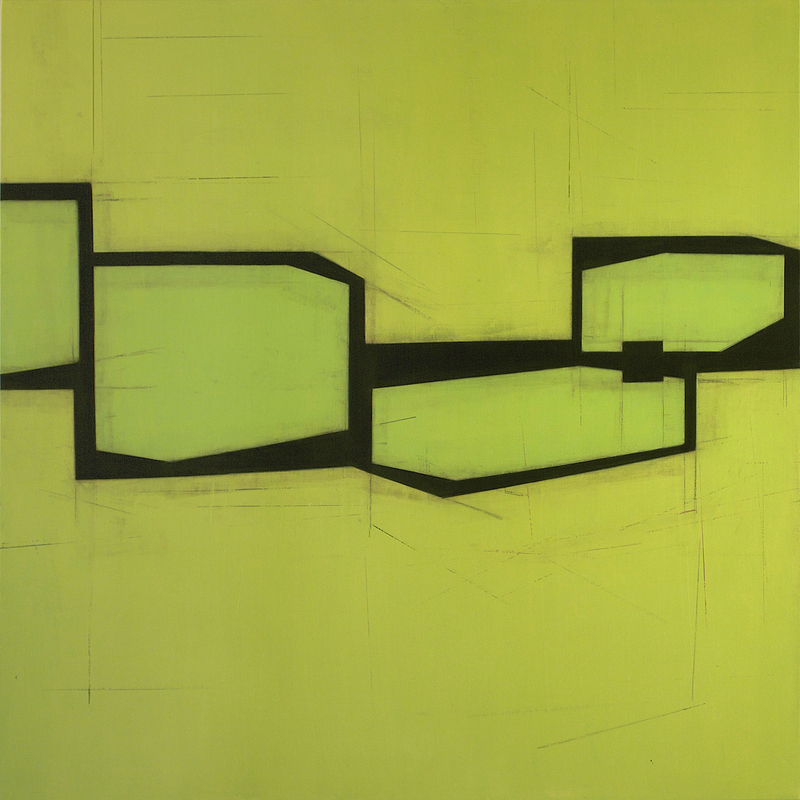 The exhibition is comprised of 12 contemporary abstract artists, including 2 local and 4 international. Each artist is linked, owner Christine Pfister explains, in several ways: through the concept of the work, in the craftsmanship of the piece, and perhaps most importantly, through the history of the creation. 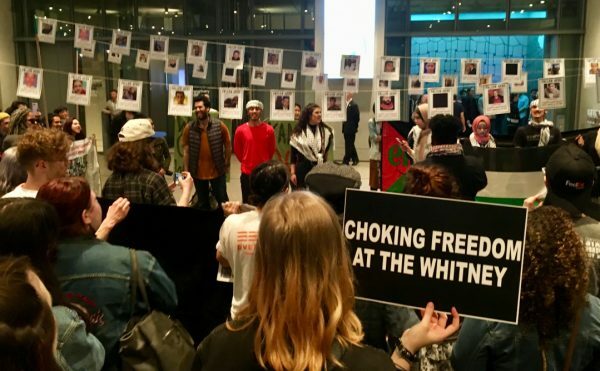 “These pieces all carry a history of art-making that spans five to ten years,” points out Pfister during a conversation at the gallery, and, in some cases, these references go back further into the past to post-minimalism and reductivism. Take, for instance, Edgar Diehl’s “MSE II,” an undulating and sculpture-like painting that is reminiscent of geometric pieces from the 1960s (think: Frank Stella). 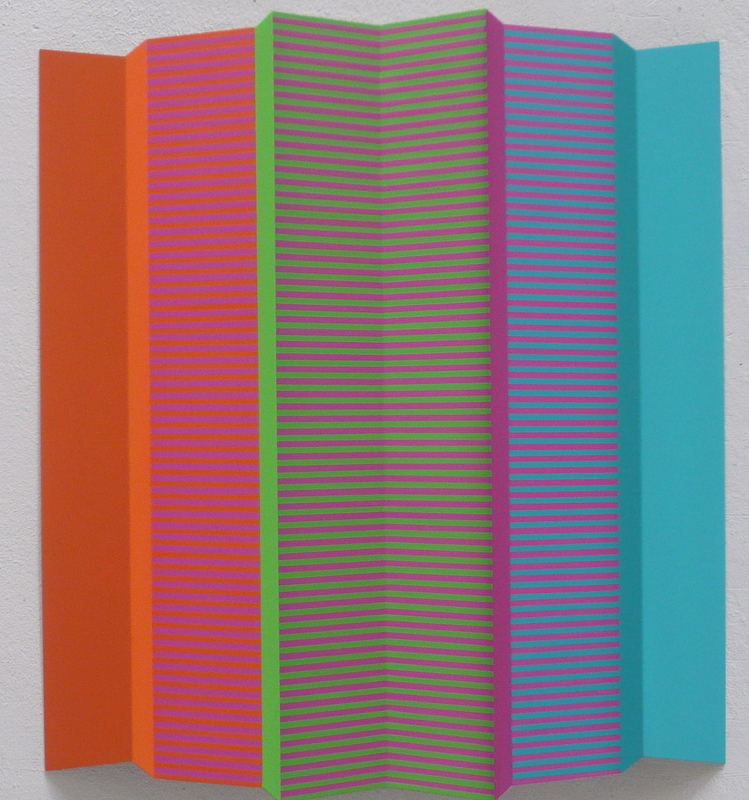 Painted on aluminum in bright neon colors of purple, pink, orange, turquoise, and green, the work is visually playful: the aluminum folds in an accordion-like manner, creating the illusion of depth and substance; horizontal lines take turn with blocks of color. Other pieces in the show play with our vision similarly. 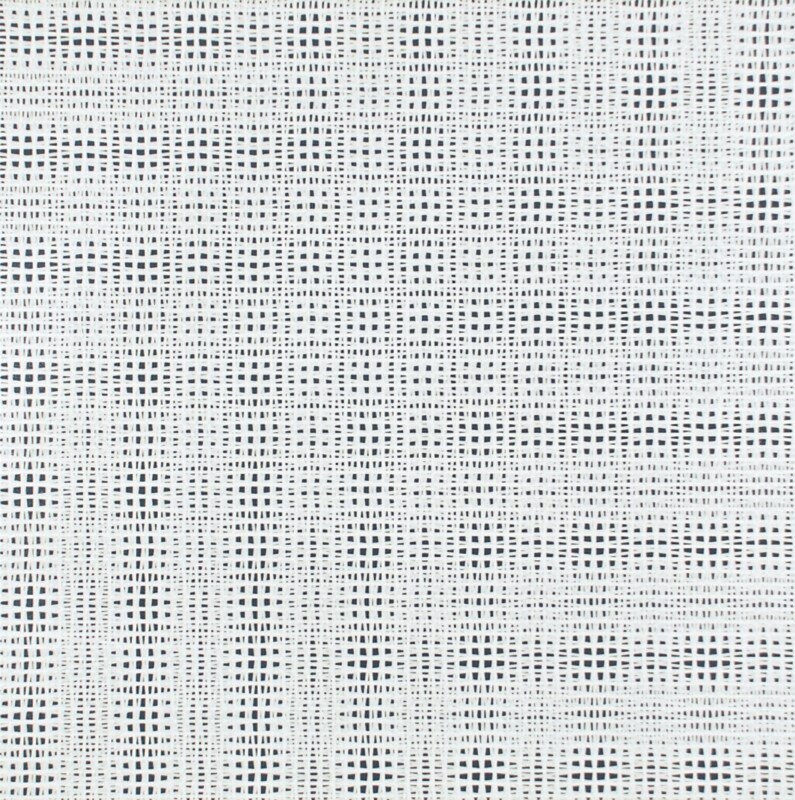 Rob de Oude’s “Dicey Dissolve” is an optical lattice of lines which seem to bend out of the canvas. Meticulously painted in shades of black and white, de Oude’s piece changes at every glance, an effect that is both dynamic and difficult to take in for long periods of time. Pfister curated and installed all of the works on view. It’s clear that the pieces are consciously placed near one another in order to create visual diversity and suggest the vastness of this survey. 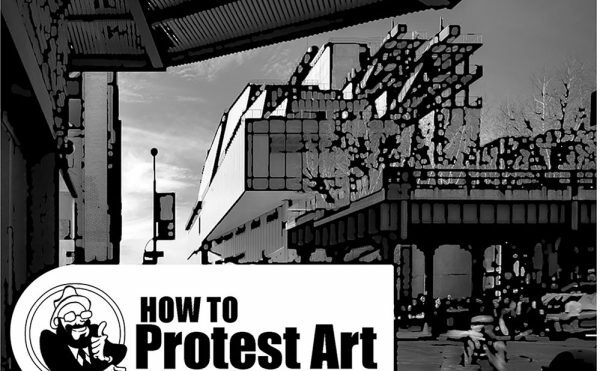 For example, a smaller charcoal-drawn work by Enrico Gomez, “Beat Hope Alive II,” is placed directly next to Steven Baris’ “Drift E2,” a gigantic lime painting and the biggest piece in the show. Through these juxtapositions, the viewer is pushed to see the show as an exploration of an incredibly large “territory” of abstract art. While the majority of the artists in the show are new to Pentimenti, they are not unfamiliar to one another. 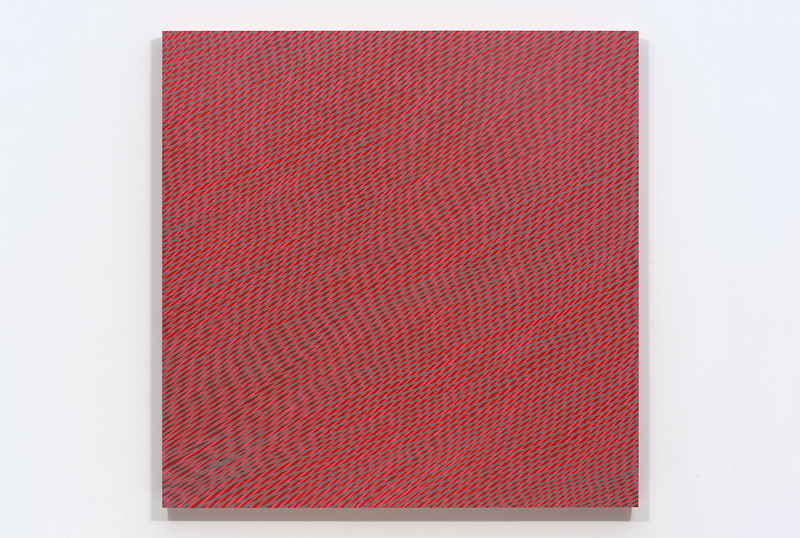 Many of them have met before through Mel Prest, whose piece “Vielen Danke Shon” is exhibited in a small alcove of the gallery entitled the “Project Room.” The work — red and gray acrylic lines melded in a way to evoke moving waves or rolling fields — pays homage to the past, like the history of abstraction in Germany. 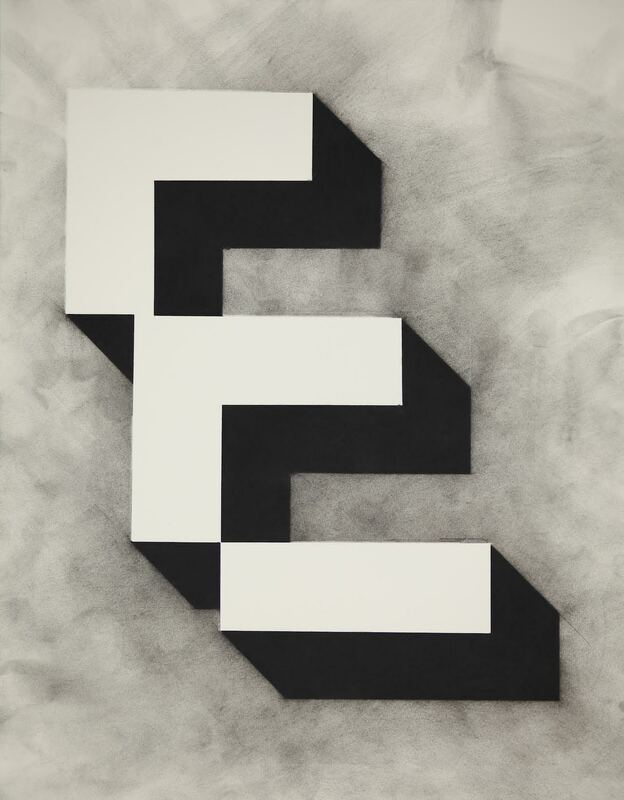 Prest, apart from participating in the show, is critical to the exhibition, having connected many of the artists to one another. She began forming these networks during her “Suitcase Exhibitions,” where Prest toured around Europe with an artwork in her suitcase, organizing exhibitions and meet-ups. Using Facebook, she was then able to connect artists with similar sensibilities from Belgium, Holland, and Germany with artists the US. “There is always a story of borders,” Pfister emphasizes, whether that means the borders of a country or even the borders of what abstraction can be. Sometimes, those borders can be eroded and styles of art can blend with other styles. Such is the case of this show, which creates linearity and continuity between the pieces. 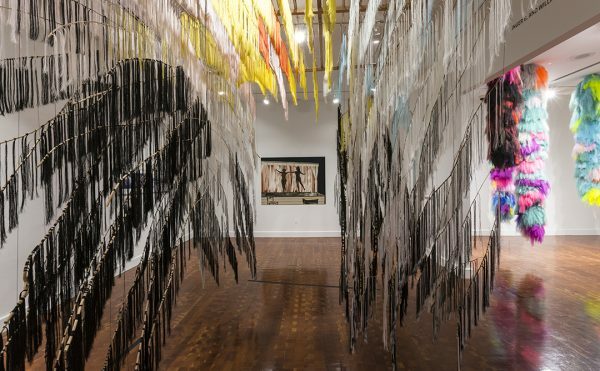 In spite of their aesthetic differences, it is this interconnectedness that somehow pulses through the show and creates an exhibition that is as dynamic as the paths taken to get there. 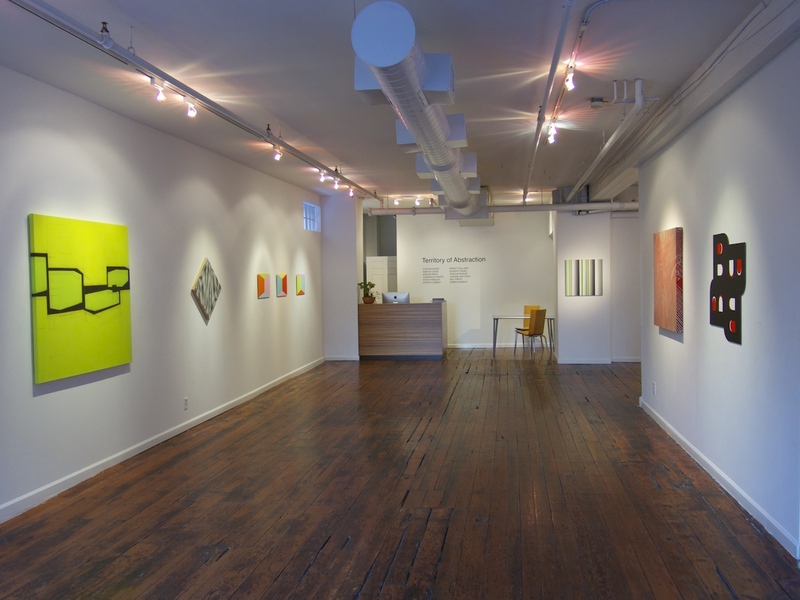 Territory of Abstraction continues at the Pentimenti Gallery (145 North Second Street, Philadelphia) through April 4.